The Yorkshire Terrier is a small, toy sized dog with dark eyes and erect V-shaped ears. Their long glossy coat is fine and silky and falls straight down on either side. Coat colors come in a steal blue and tan colour, puppies are brown black and tan. They originated in Yorkshire, England in the mid-19th century. They were bred to catch rats in clothing mills and mines and for rat-baiting. They also came in handy as hunting dogs, able to chase foxes, badgers and other small animals into their burrows. Rat-killing contests sometimes took place as a form of sport. The ferocious courage of the dog still comes to the fore occasionally when he barks at burglars or other dogs. Over the years they were bred smaller, soon becoming fashionable pets and dog show standouts. Yorkshire Terrier can be described as a little dog with a big personality. Their personality has been described among others as very confident, feisty, alert, inquisitive, energetic, brave, bossy, boisterous, adventurous and active, but they can also be very sweet. They crave close physical contact and affection and need lots of attention and time with their family. Long hours of being left alone is not for them and they will follow you around the home like a shadow and curl up on your lap as often as possible. However it's not a good idea to over-protect your Yorkie, they can pick up on your feelings very quickly, and if your actions say the world's a dangerous place for them, they can become neurotic. You must also keep in mind that they are terriers and in so being their prey-drive is high and they will chase any little creature that scurries by. So it is advised to be cautious with small pets such as rabbits, birds, rats etc, because of this breeds hunting instincts. This breed is very protective about its family and they can sometimes be suspicious of strangers as well as aggressive toward strange dogs. They will bark at intruders and strange sounds making them good watch dogs but be careful as they can also become yappy and this can cause problems with the neighbors. Yorkies can live anywhere from a farm to a flat, they are quite happy to be an indoor pet and is thus a good choice for city and apartment life. They make perfect companions for singles, families with older children and high-energy types. They are a fairly active breed and do need exercise, a daily walk is sufficient to keep them healthy both physically and mentally. However, they should not be let off the leash in an unsecured area because of their innate hunting instincts as well as their tendency to pick fight with much larger dogs. They will also enjoy a good romp in a safe open area off lead, such as a large fenced in yard. A very important thing to remember is that Yorkies are small and are thus very fragile dogs. You cannot play rough with them and you need to be careful when holding them or transporting them. No matter how many people or animals in the house, Yorkies will assert themselves, involving themselves in lots of hi-jinks that are mostly amusing and fun. This assertiveness usually comes across as self-confidence, not aggressiveness. Are willing to train and socialize from a very young age, especially house training. Only from reputable breeders! One can contact the The Kennel Union Of South Africa (KUSA) . They have a list of breeders who have puppies available. Always try and meet both parents of the puppies. This is not always possible as the sire (father) may be an imported dog, but definitely ask to see the mother. Which other breeds are most compatible with the Yorkshire Terrier? Because Yorkies have such big personalities the best companion dog for them will be one with a more docile personality. Herding breeds (such as the Collies), Mastiffs, Great Danes as well as Labradors and Golden Retrievers are all good choices. However Labradors and Golden Retrievers work best when they are already adults as they are very boisterous as puppies - big paws, not gentle or respectful of space (often ramming into things, people, other dogs). During this puppy phase (that usually lasts about 3 years) the Lab/Goldie can accidently hurt the Yorkie but once they have outgrown it they are great companions for Yorkies. Another terrier breed is not a good idea and neither is a breed that likes to use their paws more during play, e.g. Boxer's. The dog may only be playing but for the smaller dog that means getting stomped on and possibly hurt. Most definitely. This is the most ideal situation as they understand each other. Preferably have a male and female. Two females will also get along as long as they are introduced as puppies. An older female will get on with a puppy female but it is not advisable to introduce two fully grown females. Always have only one male unless you have a lot of experience handling dogs. Please read ‘Placing Littermates in the same home’ and ‘Double Trouble – (why you shouldn’t get two puppies)’ on our website for more information. They can be suspicious of other dogs but if they are well socialized and trained from an early age they can get along well with any other pets. But keep in mind that they will also chase anything that runes away from them no matter how well they are socialized. They may become possessive of their owners if a new pet is brought into the house. Being terriers, they may want to challenge the "intruder," and if a fight breaks out, the terrier spirit is to fight to the death. Take a lot of care when you're introducing a Yorkie to a new animal. Because of their size, Yorkshire Terriers do better with older children who've been taught to respect them. Toddlers and small children often see the dogs as toys and then carry them around like dolls, this can cause the dogs to become snappish as they don’t like being startled, teased or handled roughly. There is also the risk for children to drop them, step on them, or hold them too tightly and being a toy breed these dogs can easily get injured. It is recommended that children always be supervised when playing with these dogs & puppies. The Yorkshire Terrier is intelligent and quite easy to train, they strive to please and learns new commands quickly at an above average rate. However they can be difficult to housetrain but with persistence this can be done, crate-training is recommended. However they can sometimes be stubborn if owners do not give the dog proper boundaries, it is important to set limits and be consistent. Because they are so small and cute people tend to let them get away with a lot more than they should, the dogs then assume that they are the boss of the house and they become very difficult to handle. Start training when they're puppies, and you'll have much better luck than if you let them have their way and then try to correct bad habits. Like all dogs, Yorkies needs early socialization--exposure to many different people, sights, sounds, and experiences--when they're young. Socialization helps ensure that your Yorkie will be a friendly, well-rounded dog. The Yorkshire Terrier sheds little to no hair and is good for allergy suffers. 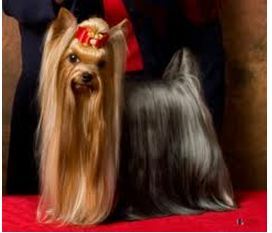 Show dogs who keep the long and silky coat need extensive grooming, daily brushing and professional grooming regularly. For dogs that are kept as pets the owners get their coats trimmed short by professional groomers every few months and then it only needs to be brushed about once a week. These dogs should be bathed only when necessary and must be dried properly after each bath. Their eyes and ears need to be cleaned regularly to avoid any infection, you should also brush their teeth regularly and schedule a professional cleaning by your vet at least once a year. Their nail and the hair around ears, eyes and paws should be trimmed regularly. Remember as you groom to check for sores, rashes, or signs of infection such as redness, tenderness, or inflammation on the skin, in the nose, mouth, and eyes, and on the feet. This will help you spot potential health problems early. Yorkies are generally healthy but because of their small size they are prone to certain health conditions including hip and joint issues, bronchitis, eye problems, obesity, poor digestion, tooth decay, bone fractures etc. This dog has a tendency to gain weight quickly so should not be overfed and they can have delicate digestive systems and may be picky eaters. They prefer a couple of small meals to one big meal per day, Some dry food or bone should be given to it to chew to help keep their teeth strong and clean. There life expectancy is anything between 13-18 years. The smaller the dog the shorter their life expectancy is because the smaller dogs are more prone to health problems. Yorkies tend to become lighter with age. Hormonal changes can also affect color. Females in heat go lighter, and then darken again after their season is over. Yorkies come in different sizes, the show dogs tend to be smaller than the pet dogs (who can sometimes be twice the size) and you also get the tea cup size. A twelve-pound Yorkie saved an elderly woman by fighting off an Akita weighing eighty pounds. The Yorkshire terrier survived and only required nine stitches. Make sure that they are kept warm when its cols and cool when it’s hot. Buy a Yorkie because it is a cute puppy and looks appealing, they all do but they grow into a very demanding dog if you are not willing to put time and effort in.